(Phys.org)—When most people think of astronomers, they envision scientists who spend time peering at stars and galaxies through telescopes on high mountain tops. Rutgers astronomer Rachel Somerville depends on those who make such observations, both from telescopes on the ground and orbiting earth in space. But her primary tool for understanding how galaxies formed billions of years ago – and how they continue to evolve in our contemporary universe – are large computers. Instruments such as the Hubble Space Telescope peer to the farthest reaches of space, opening windows in time that reveal how galaxies looked as they took shape in a young universe. Computer modeling then helps astronomers make sense of what they're seeing and build a better understanding of how today's galaxies first formed. Somerville, a professor of astrophysics in the Department of Physics and Astronomy, School of Arts and Sciences, creates computer models or simulations of the physical principles that underlie galaxy formation. 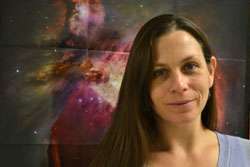 Her simulations model how gases such as hydrogen and helium coalesce into stars and galaxies and how exploding stars and black holes impact their galactic environments. At a scientific conference earlier this month, colleagues recognized the importance of Somerville's work when the American Astronomical Society and the American Institute of Physics awarded her the Dannie Heineman Prize in Astrophysics. The prize, which recognizes exceptional work by mid-career astronomers, cited Somerville for providing fundamental insights into galaxy formation and evolution using modeling, simulations, and observations. Somerville is a newcomer to Rutgers, appointed in October 2011 to the George A. and Margaret M. Downsbrough Chair in Astrophysics. As a theoretical astronomer, she values the opportunities she gets to interact with observational astronomers at Rutgers and elsewhere who provide her with new data that make her models more comprehensive and robust. "It's hard to make models that fit all the observations," said Somerville. "I try to go the extra distance to connect what the models predict with things that we can actually observe." Astronomers cannot see any single galaxy evolve through a telescope. Modeling galaxy formation is essential to infer the evolutionary paths that different types of galaxies follow. "We see galaxies at different points in their lifetimes and in different wavelengths," she explained, referring to images acquired with visible light, radio waves and X-rays. Models then help astronomers predict which kinds of early galaxies evolved into disks like our Milky Way while others evolved into the round balls of stars that astronomers call elliptical galaxies. Before joining Rutgers, Somerville held a joint appointment as associate research professor at Johns Hopkins University and associate astronomer with tenure at the Space Telescope Science Institute (STScI). STScI manages selection, planning and scheduling of scientific activities for the Hubble Space Telescope. Before that, she held faculty appointments at the Max Planck Institute for Astronomy in Germany and the University of Michigan, and postdoctoral appointments at the Hebrew University in Jerusalem and Cambridge University in the United Kingdom. Somerville's goal at Rutgers is to build more expertise in galaxy formation theory and help the department's astronomy group pursue new areas such as the study of extrasolar planets. "Rutgers is a great place for galaxy formation theorists because we have opportunities to interact with the excellent observational astronomers here," she said, noting the university's involvement with the powerful new Southern African Large Telescope, also referred to as SALT. "I've benefitted from supportive colleagues and contact with graduate and undergraduate students. I'm constantly inspired by their enthusiasm."